Helicopter Links 2016 Web Statistics and our Search Engine Optimization. San Diego, California, USA: Helicopter Links had a total of 86,546 visitors (including return visits) in 2016. 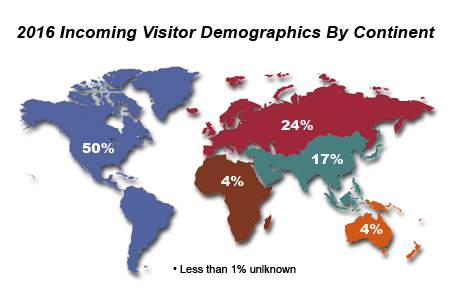 The total among of unique visitors was 68,925. Per Google Analytics, over 80% of our visitors came from organic searches. This means that most people visiting Helicopter Links were not looking for Helicopter Links; instead, people were typing in two (2) or more search terms in Google (or another search engine), looking for a list of companies in the helicopter industry and then found Helicopter Links website and then used Helicopter Links website. All of this information is important for business owners and marketing departments because when a buyer is looking for a list of companies, products, or services to choose from online, and who are in the helicopter industry, we provide them with that list. This also means that companies and organizations advertising on Helicopter Links are having their ads seen by buyers, at the very moment they are in the buying process. 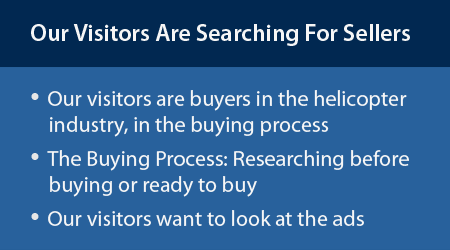 The reason people are visiting Helicopter Links is the same reason why people are visiting Amazon or Ebay, they are buyers either researching before buying or are ready to buy. Our visitors want to look at the advertisements. A marketer's and boss's dream: To advertising on a place where buyers want to look at their ads! In comparison, magazines are where the seller is searching for buyers. Magazines have readership numbers. That's because people are using the magazine to read the articles in the magazine! While someone is reading a magazine, they might not be interested in looking at advertising because they are not researching before buying or they are not ready to buy something. When people are using Helicopter Links website, our visitors are now taking time out of their business day because they are ready buy a product or service, research before buying or looking for information from a company or organization. Helicopter Links can help almost any company in the helicopter industry, which wants to advertise to local, regional, national and/or international buyers.